Funeral services for Reverend Robert Milton Crane, 1952.
and I will dwell in the house of the Lord for ever. Page 3: In Loving memory of the Reverend Robert Milton Crane, Resident of Pomona, California. Passed away March 11, 1952. Services. Christ Episcopal Church. May 3, 1952. 11:00 A.M. Officiants. The Right Reverend Frances Eric Bloy, D.D. Bishop of Los Angeles. 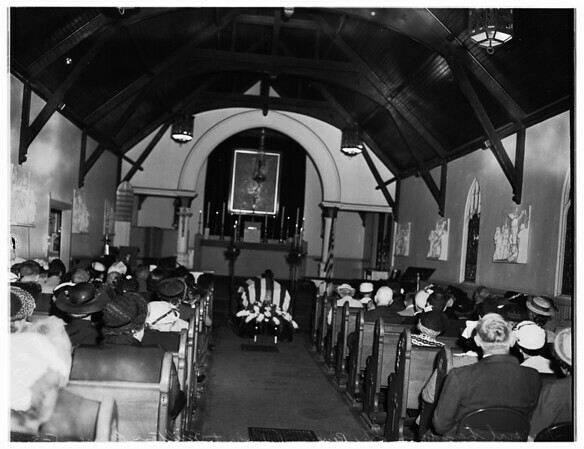 The Reverends Harley G. Smith, Sierra Madre, James Jordan, Hollywood, Charles Scott, Pomona, John G. Mills, Ontario. Music: Church Choir and Organist. Interment: Pomona Cemetery. Page 4: Appreciation. The members of the family wish to express their gratitude for your many kindnesses evidenced in thought and deed, and for your attendance at the memorial service. Todd Memorial Chapel. Funeral Advisors and Directors. 570 North Garey Avenue, Pomona". Edits: "1422 S. San Antonio. due to artillery shell hit in Korea".